Many of the pieces of equipment used by technical divers look different to the equipment used by recreational divers. However, for most of the time, the basic principles are the same. A rebreather is simply a way to reuse the gas breathed out by the diver in conjunction with a method of removing the carbon dioxide produced by the diver. The main advantage of a rebreather is that it is much more efficient on gas usage. When breathing normal air at the surface, we use up about 4% of the oxygen in the air for our metabolism and breathe out the rest of the oxygen as well as all the nitrogen. This means that 96% of the gas we breathe escapes with each breath. At depth, this is made even worse by the fact that we are breathing gas under much higher pressure and so each breath contains a much higher volume of air. At 40m, we are breathing five times the volume of air with each breath compared to the surface and at 90m we are breathing ten times the volume that we would be on the surface. With every breath, this gas escapes from our second stage and bubbles to the surface. This is inefficient as the body still only needs the same amount of oxygen but we are wasting ten times as much gas with each breath in order to obtain it. This is one of the reasons why for open circuit divers gas planning and breathing rate is so critical. The limiting factor for an open circuit dive to 90m is almost certainly going to be the amount of gas that needs to be carried for the dive. A rebreather avoids this problem by re-using the gas breathed out by the diver, as the majority of the gas isn’t being wasted the diver doesn’t need to carry as much gas in order to do the same dive. A rebreather works by catching this exhaled breath and instead of allowing it to escape it reuses it in the next breath. The small fraction of oxygen that was used up by the body is replaced with more oxygen. This means that rather than wasting the vast majority of each breath, we reuse all of the gas. By reusing our gas, this provides three key benefits to the technical diver. Firstly, we don’t need to use anywhere near as much gas as an open circuit diver. The amount of oxygen required by the body is roughly the same at any depth and so our oxygen will last the same at 100m as it will at 20m. The balance of the gas in the breathing loop, known as the diluent, is reused rather than wasted and so again we use the same amount at 100m as at 20m. This vastly decreases the amount of gas we will need to complete the dive and rather than twin 20L cylinders we can use two 3L cylinders. On open circuit, we breathe much more at depth due to the effect of pressure and so as we go deeper and deeper we have to take larger and larger cylinders. Despite taking these large cylinders, they will still be used up very quickly and so the amount of available gas becomes the most critical part of our dive planning. On a rebreather, our gas supply is used up at the same rate irrespective of depth and so the amount of gas we are carrying is no longer the limiting factor. This means that running out of gas on a rebreather is much less of a concern than for an open circuit diver. Instead, the critical factors become the amount of decompression we are incurring, the duration of our carbon dioxide absorbent and our risk of oxygen toxicity. One of the biggest factors that comes into the decision to switch to a rebreather is costs. This has two aspects, the costs of the rebreather, including buying and maintaining it, set against the cost of open circuit diving. One of the biggest disadvantages of open circuit trimix diving is the cost of the gas. A twinset of trimix can cost anything from £30 for a relatively weak mix for use in 40m to over £100 for a mix suitable for diving deeper than 100m. This makes each trimix dive an expensive proposition. On the other hand, a rebreather uses much smaller cylinders because the gas is reused rather than wasted, as a result we use much less and the gas costs are much lower. We might only be spending £5-£10 for the same mixtures discussed above. As a result there is a significant gas saving when compared to open circuit diving. This can look very attractive when you are spending considerable amounts on each open circuit fill. However this must be set against the costs of the rebreather. Depending on the model a rebreather is likely to cost between four and eight thousand pounds. If you go for an older second hand model then you might get one for less than this. In addition to the initial cost of the rebreather you will need to factor in training on the rebreather which is likely to add on another thousand pounds. In addition there will undoubtedly be additional costs to add on extra equipment to the basic rebreather. As a result it is not uncommon for the initial start up costs on a rebreather to be between 6 and 10 thousand pounds. Obviously you will need to do a lot of trimix diving in order to save enough to justify this initial outlay. The majority of divers do not do enough diving to clearly justify buying a rebreather based on savings in gas costs. Unless you are doing 20 or more trimix dives a year then it is not cost effective. If you also do a significant amount of recreational diving then each dive may actually cost you more on a rebreather. On open circuit, you may only need to pay for an air fill but on even the shallowest dive you will still need to use pure oxygen in one of the cylinders and use carbon dioxide absorbent in the rebreather. The annual replacement of the three oxygen sensors and handset batteries also needs to be taken into account. This means that a shallow recreational dive may only cost £5 for an open circuit diver but £10-£15 for a rebreather diver. It is clear that unless you are doing significant numbers of deep trimix dives a year with little or no recreational diving then the gas savings from using a rebreather will not outweigh the initial start up costs. However, there are still a number of other reasons why a rebreather is an attractive option. The third advantage that the improved gas usage provides is in simplifying gas logistics during longer dive trips. Open circuit divers may be using up twin 12L, 15L or even 18L cylinders on each trimix dive. In addition they may be using up to 4 stage cylinders for decompression gas for each dive. This requires lots of additional helium and oxygen each day and filling these large back gas cylinders and decompression cylinders each day is expensive, time consuming and labourious. The fact that a rebreather uses smaller cylinders makes the logistics of filling much easier. The volumes of gas needed are much smaller when filling a 3L cylinder rather than twins 12s and so it becomes feasible to take enough gas with you for even a week's diving. This contrasts with the situation when using open circuit where significant volumes of helium and oxygen will be required as the majority will be breathed out and wasted. This can make a big difference if you don’t have a local dive shop that can fill trimix. If you have to drive 50 miles there and back to drop off a twinset for a trimix fill and then do the same thing next day to pick it up, then the logistics of this can be significant. Similarly, if you are diving somewhere without easy access to a dive centre that can fill trimix, the ability to take your own gas simplifies the planning and logistics. Of course, this assumes that the rebreather will always work as intended. Just in case there are any problems with the rebreather, we also need to carry open circuit gas to get us safely to the surface. In this case, we would need a bailout cylinder that we could start using at the maximum depth and would then need sufficient bailout to get to the surface completing all our decompression. Unlike the open circuit diver, the rebreather diver will not use their stages unless there is an emergency but will still need to carry them. However on open circuit the diver will use the decompression stages on each dive and so they will need to be filled each day. The other advantage of a rebreather is that it can reduce the decompression obligation when compared to the same dive on open circuit. For a diver using a twinset and a stage cylinder, they may plan their gas to have the optimum mix on the bottom, i.e. the highest oxygen percentage in order to reduce the amount of inert gas absorbed by the body. They will also make a choice of the decompression gas carried in the stage cylinder with a view to ensuring that they get rid of the inert gas as fast as possible during the decompression. However, the choice of each of these gasses will always be a compromise. The bottom gas will be chosen to be as rich as possible but with some margin for error in case the dive is a little deeper than expected. If the diver ascends up from the planned maximum depth, then the mix is no longer the optimum mix. Equally, the decompression mix will only be the most effective mix at the depth at which the diver switches to it. Prior to the switch, the diver could have switched to a leaner mix and at the later stops there will always be a richer mix that would have provided faster offgassing. A rebreather avoids these problems by constantly adjusting the gas being breathed to ensure the minimum amount of inert gas is being breathed. The rebreather (or the diver in the case of a manually operated rebreather) adds oxygen to ensure that the minimum amount of inert gas is being breathed. At depth, the diver can ensure that the breathing loop of the rebreather contains the maximum amount of oxygen and hence the minimum amount of inert gas. This will reduce the rate of ongassing. As the diver ascends and completes his decompression stop, the diver can ensure that the mixture again contains the maximum amount of oxygen which will accelerate the offgassing and reduce the required decompression. In this way, the rebreather is constantly providing the best gas for the depth the diver is at. To simulate this on open circuit a diver would have to switch to a new breathing gas every meter of the ascent in order to constantly have access to the best possible decompression gas. For this reason, a rebreather is sometimes unofficially called a best mix generator. We can see that rebreathers offer a number of significant advantages over open circuit diving. However, a rebreather introduces a number of significant additional costs, risks and complications to any dive and should not be seen as a magic wand to solve all of the potential problems of deep technical diving. In the first place, buying a rebreather is an expensive proposition. Prices vary from £3500 to over £8,000 for the unit alone. When combined with training and the inevitable extra bits of kit, it is a false economy to buy a rebreather in order to save money on gas fills. In addition to the cost, there are a number of other risks introduced by using a rebreather. Whenever we breathe out as well as exhaling the remaining oxygen and inert gas, the body has also added carbon dioxide. If our breath is recycled without removing the carbon dioxide, then the levels will build up and eventually the diver will succumb to carbon dioxide poisoning, this is one of the biggest risks of rebreather diving. In order to avoid this, the carbon dioxide must be removed by a chemical process. This takes place when the exhaled gas passes through a scrubber which is packed with a suitable chemical designed to remove the carbon dioxide. Correctly packing the scrubber is one of the most important steps in preparing a rebreather as incorrect packing can allow carbon dioxide to be ‘channelled’ through the scrubber and cause a build-up in the breathing loop and lead to carbon dioxide poisoning. This can cause headaches, lack of concentration, unconsciousness and death. Unfortunately, the diver suffering from this condition may be unaware of the condition or may be so incapacitated as to be unable to respond to the problem. Overusing the scrubber material is another potential cause of carbon dioxide poisoning and for this reason it is vital to monitor the amount of time that the material has been used and to replace it at the appropriate time. If there is any doubt in the diver’s mind that they may be suffering from carbon dioxide poisoning then they are taught to bailout to a known source of gas. For this reason, rebreather divers carry open circuit bailout gas. 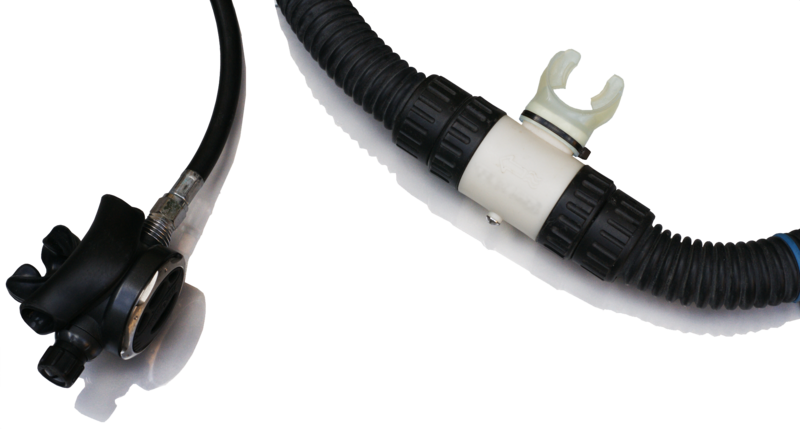 In addition, many rebreathers are supplied with a Bail Out Valve (BOV) which allows the diver to switch from the rebreather loop to an open circuit regulator at the flick of a switch. Of course, once the diver has bailed out to open circuit they are limited by all the same gas consumption issues that the open circuit diver has to face. This is one of the reasons why a rebreather is not necessarily the full solution for deep technical diving. The diver will need to carry enough gas in order to be able to safely ascend in the case of a problem with their rebreather and so will have to carry the same amount of decompression gas as an open circuit diver. The alternative approach, known as the alpinist approach, is assume that any problem can be avoided by careful preparation of the unit or by managing the problem on the unit rather than by bailing out to open circuit. In addition to excess carbon dioxide, the other big danger that rebreather divers face is an incorrect partial pressure of oxygen. In an eCCR, the rebreather itself maintains the partial pressure of oxygen within the breathing look whilst on an mCCR it is the divers' responsibility to maintain the partial pressure. Either way, it is always the diver’s responsibility to know their partial pressure at all times and this is one of the golden rules of rebreather diving. All rebreathers will have a display which shows the partial pressure of oxygen. This can be an electronic gauge which is often wrist- or console-mounted or can be a visual display using coloured LEDs. These Head Up Displays (HUDs) can provide instant warnings of incorrect partial pressure levels. During the dive, a diver will usually aim to maintain a partial pressure of between 1.0 and 1.4 bar of oxygen. This is known as a ‘set point’. Allowing the partial pressure to rise to high can lead to oxygen toxicity problems whilst allowing it to fall too low can lead to hypoxia and a blackout. The equipment used in a rebreather is more complicated than open circuit and the procedures required are more detailed and intensive. Preparing a rebreather to dive will inevitably take more time than preparing open circuit equipment. The added complication of the kit also increases the chances of a problem occurring, either before the dive causing it to be aborted, or during the dive causing potentially more serious problems. These considerations are covered in extensive detail during any rebreather training course but one of the biggest dangers for rebreather divers is complacency. As they build their experience, they start to take short-cuts or start to neglect basic checks. It is typically divers who have around 50 hours of experience who tend to fall into this complacency trap. Even if you wont save money and don’t need a rebreather for logistic reasons, there are still other reasons to switch. Diving is a hobby and so doesn’t always have to be justified on cost reasons. The cheapest option is not to dive but most of us don’t consider this a possibility. In the same way that some people spend their money on motorbikes, horses, home cinemas, model helicopters or any other hobby, there is no reason why someone shouldn’t spend their money on a rebreather just because they want one. Other people may switch to a rebreather to challenge themselves to learn something new. As we have seen there are a number of reasons why many divers want to switch to a rebreather. However, the risks of rebreather diving mean that there are some people who are better suited to rebreather diving than others. Rebreathers are significantly more complicated pieces of equipment than an open circuit scuba set. Whilst rebreathers do not require a huge amount of effort they do nonetheless require more care and maintenance than open circuit. For divers that throw their kit into the back of the car or into the garage and then don’t look at it until the next dive, this can cause a problem. This type of person is not really suited to rebreather diving unless they can discipline themselves to ensure they maintain the rebreather. On the other hand, there are many divers who enjoy cleaning and maintaining their equipment almost as much as the dive itself. They get pleasure from adjusting the kit until it is just right and it is viewed as part of the hobby rather than an added chore they must do. This type of person is ideally suited to rebreather diving. In addition to cleaning and maintenance, rebreathers require discipline whilst diving them. There is a certain mindset that is required to ensure that the unit is assembled correctly each time and that all of the pre-dive checks are rigorously followed. Most rebreather accidents are caused by the divers not following the correct procedure. This includes not diving the unit if there is any problem with it. Many divers become complacent and will dive with known problems with their rebreather. They are confident that they can overcome the problem and in the majority of cases they manage to deal with the known problem. However, if there is any problem during the dive, the impact of the initial problem can be significantly increased by subsequent problems. It requires a significant level of discipline to call off a dive for what might appear to be a minor problem but becoming complacent about these failures is one of the most common causes of rebreather accidents. During the dive, the diver must constantly monitor the unit to ensure it is operating correctly. This is summed up by the golden rule of rebreather diving “Always know your partial pressure”. It doesn’t matter if the diver is at 10m or 100m, the level of monitoring is the same and so a 10m dive must be approached with the same mindset as a 100m dive. As such, there is no such thing as a casual rebreather dive. Not all divers have the mindset to adjust to rebreather diving but without this mindset they should not consider rebreather diving. In order to be a safe rebreather diver, there are a number of skills that need to be mastered over and above the basic open circuit skills. Some of these are related to the normal operation of the rebreather and some are related to emergency situations. Like any skill, it takes practice to master these skills and practice to maintain them. When moving from open circuit to a rebreather, there are skills, like buoyancy control which must be re-learnt. This takes time and effort. For an experienced diver, this means the frustrating process of going back to basics and building up their experience. Unless you are prepared to put in the time to master the basic skills, you will always be diving on a base of weak rebreather skills, even if you were previously a very experienced open circuit diver. These skills also need to be practiced regularly in order to ensure that they are maintained. This means that it is essential to dive a rebreather regularly in order to maintain the appropriate skill levels.